Husband and baby went to the science museum. I bring 15-month old Julia almost every day and she picks and chooses which part of the play areas she wants to explore. Each trip is different, and she interacts with the exhibits more each visit. 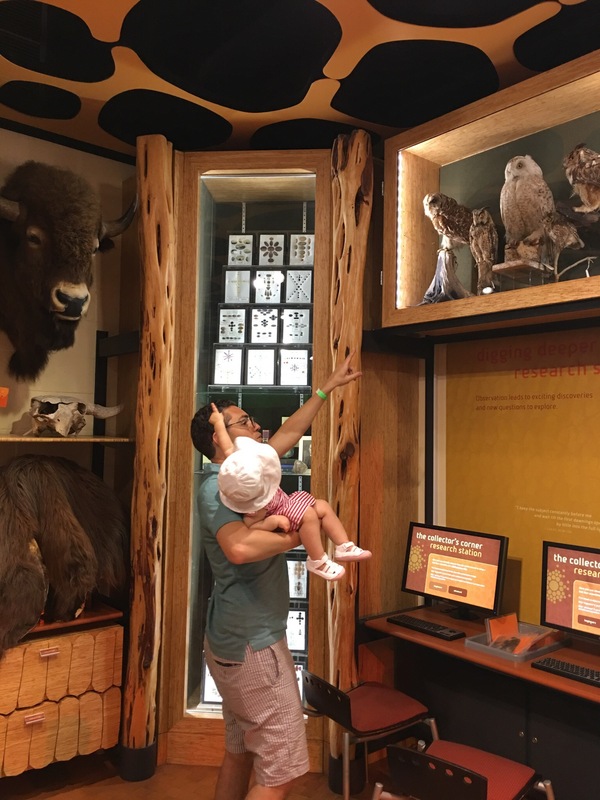 Watching her grow up in the museum is a science experiment of our own. She was so excited to have her father there this time, even though we go at least once a weekend together. She ran ahead to show him all of her favorite things. I love this picture because it seems to best represent the moment’s energy. He wanted to show Julia around and she had just as many ideas. After charging into the insect room, she turned around with glee. He was just a moment behind and out of sight, and her outer energy deflated. As he came into view she led the way to our new favorite creature. It was heart warming for me to see her so proud, and on a mission to show her father everything she and I have studied that week. She’s becoming a mini human more than a baby and we are fortunate to capture special moments like this. She is a person. From the very first moment. Touching post! Nice photo. They grow so quickly! Pingback: Opposites (Crossroads) | What's (in) the picture?